The koala (Phasclarctas Cinereus) is a mammal and a marsupial. A marsupial is an animal with a pouch. Koalas are often referred to as a Koala bear. However they are not a bear. The Koala is one of Australia's best known animals. Koala is an icon represented when promoting Australia to the tourist industry, and in general people adore these cuddly creatures. 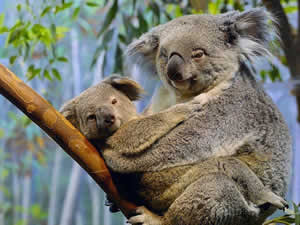 There are two species of Koala, the Southern Koalas and the Northern Koalas. The name Koala comes from an Aboriginal word. It means "no drink", as Koalas get enough fluids through the eucalyptis leaves they feed on. Koalas are found all over east Australia, mainly in the south east. The male Koalas are larger than the females. Southern koalas are larger than Northern koalas. They have a grey soft furred coat, with a white chest. A flat nose and big ears, and clawed feet for climbing. Koalas are very placid animals, and do not move around much, they are only active for about 2 hours of the day. There are only 6,000 to 8,000 koalas in the wild. The mother has a deep forward opening pouch. Koalas spend most of the day in trees. The old Australian joke of "Koalas: Eats Roots & Leaves" is not quite correct. Koalas feed on eucalyptis leaves, which they have a variety of twelve different species to choose from. This is basically the only thing they do eat, although there are a few exceptions. Did you know? Koalas make an extremely loud and agressive growling noise. Hi. You humane animal appeared. Koalas are rare animals. Almost never seen by me, when I often enter the forest. I never saw it, Hobbes in the zoo gembiraloka jogjakarta. My back and visit my blog. Do not forget also the content of the comments. Koala sebenarnya gk hanya ada di australia, tapi ada juga di Papua, malah jenis2 koala yang langka banyak ditemukan di Papua. gw pernah bikin gini tapi gak nongol2 adsnya. wah-wah cantik juga tuh binatang, tapi lebih cantik yang punya blog..
Sekitar seminggu yang lalu saya melihat bangkai binatang liar tergilas mobil di jalan. 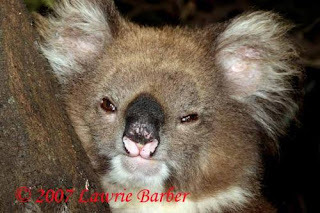 Dari bulu-bulu yang tampak, sepertinya kera/monyet atau kukang atau koala. Saya tidak tahu persis jenisnya karena cuma melihat sekilas. Di daerah saya juga juga sering saya lihat bangkai kelelawar besar (kalong) yang tergantung di kawat listrik lantaran mati kesetrum. Pemerintah dan LSM/NGO perlu memperhatikan kelestarian binatang langka dan melakukan tindakan nyata agar tetap lestari. Btw, blognya neng Putty bagus sekali,benar-benar go green blog. Lama sekali neng Putty tidak singgah di blog saya, saya juga sudah lama tidak ngeblog karena sibuk dan badan kurang fit. Terimakasih dan salam eksperimen.